WE TRIED THE NEW CHOCOLATE MILKY BUN @ AFTERS ICE CREAM - FOUNTAIN VALLEY - EAT WITH HOP! Afters Ice Cream, it's been awhile since I've had you. You've got a new chocolate donut now for the milky bun? Even the inside of the original location in Fountain Valley looks different! What happened to all the crates in the middle of the store that made it look like everything was still unfinished and under construction? And who is this dude telling us where to stand in line? Of course the creators of Afters Ice Cream are marketing geniuses, encouraging photos and selfies and all that. Wow, it has really been a long time! I remember back in the day when the milky bun was only $5... but now it's $6!? I'm feeling the price changes! My wallet too! Their flavors are pretty much the same though. My faves are the Jasmine Milk Tea and Cookie Monster! Your milky bun includes one free topping! Here is Elijah and Kevin eating their ice cream. Elijah just got his fave: the Jasmine Milk Tea ice cream while Kevin dared to try the new milky bun with the chocolate flavored donut. When Afters Ice Cream first opened a couple years ago the hype was serious. Like I'm talking over-an-hour-wait serious. And I actually waited. Ok. So back then it seemed like it was worth the wait because it was fun going with friends and trying something new. Just catching up and hanging out sure passed the time by quickly! Especially, I often suggested this spot to my international friends because... well donuts + ice cream together kind of screams "American" to foreigners. My faves are Jasmine Milk Tea and Cookie Monster. 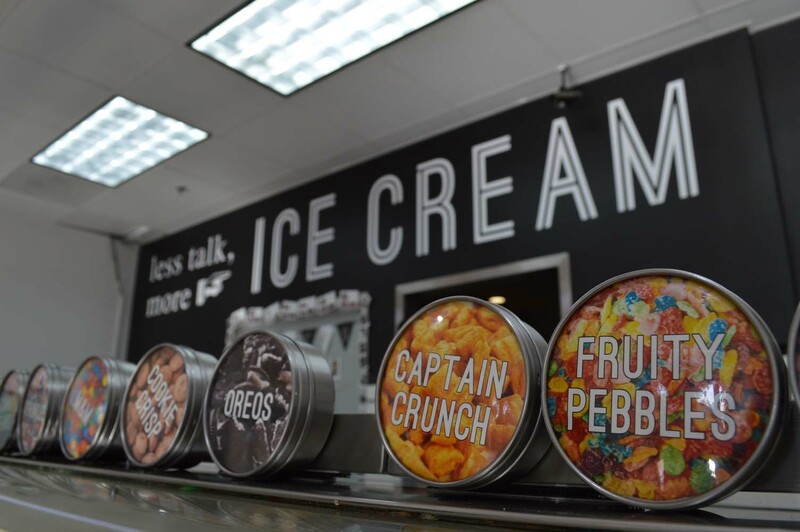 Afters Ice Cream has other interesting flavors such as Vietnamese Coffee and Milk and Cereal. I went to Afters Ice Cream more than I would like to admit. At the time donuts and ice cream tasted so good together. They still do I think but somehow I feel like the Milky Bun lost it's appeal. Maybe because I'm sick of it? Had it way too often? I don't like the glazed donut. It's just a sticky mess and hard to eat. I usually just get the normal donut and it's not as sweet (although overall still very sweet) + ice cream. But somehow, it just tastes very "bread" like. Like the donut texture is very dough-y. Did Afters change it? Or is it just me? Either way. I am no longer interested in the Milky Bun. But I would still get the ice cream! I think Afters Ice Cream is a great place to go to at least once. Just to say you've been. It's like... a novelty dessert. The Milky Bun that is. The ice cream? You can get better elsewhere. My problem with Afters is that they use way too much artificial food coloring. They claim that it's all handcrafted. But by whose hands? They sure don't make the actual ice cream in the back of every shop. It's actually all ordered. The original location in Fountain Valley is so different compared to before. The decor is still minimal. But they no longer have the crates in the middle. I actually liked that. I have to say, the creators behind this brand are genius at marketing. Their social media presence is incredible. Online they seem to be the most popular ice cream. In real life maybe not so much now. But you can tell once you walk into any shop that selfies are encouraged. Don't forget to post on Instagram! VISIT THEIR WEBSITE FOR THEIR OTHER LOCATIONS!